Kolkata Knight Riders have a clear cut plan for winning matches this season. They take the game deep and hand over whatever is left to Andre Russell to finish. In four matches this season, Russell has made 49*, 48, 62 and 48* at a blistering strike rate of 248.44. Russell came in to bat at the Chinnaswamy with the equation for Kolkata being 68 runs to win off 26 balls. The West Indian was once again brilliant as he smacked seven sixes in a 13-ball 48* that took Kolkata over the line with five balls to spare. 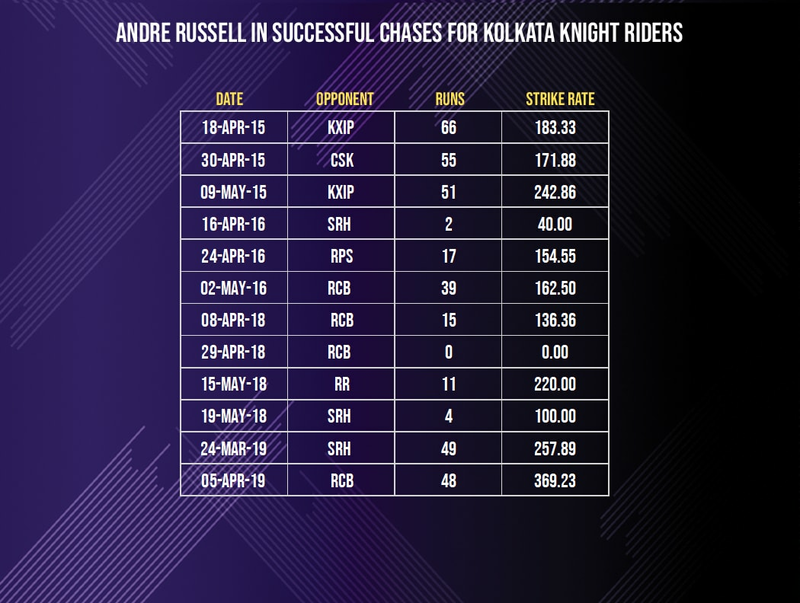 Russell has been outrageous in run-chases for Kolkata in the IPL. This is his fifth score of 40 or more in successful run-chases for Kolkata in the IPL. Against Sunrisers Hyderabad in the season opener for Kolkata, Russell had made 49 at a strike rate of 257.89. In 2015, he made three half-centuries in successful run-chases with strike rates of 183.33, 171.88 and 242.86. Russell's strike rate of 369.23 is his best in any successful run-chase for the franchise. The West Indian hit seven sixes in the match which took his overall tally in the season to 15, the most for any player. Russell also has the best strike rate in the season (248.44) and the fourth-best average (79.5). What's even more interesting is how his strike rate compares to the rest of the team. In this season, his strike rate of 248.44 is nearly 90 more than Kolkata Knight Riders’ rate of 138.98. His effect in the death overs (15-20) has been substantial for Kolkata and this is evident from his outrageous numbers in this phase of the innings in the IPL. He has batted in 35 innings in this period and averages 28.80 with 749 runs. As is the case with most of his numbers, Russell's strike rate is his most interesting aspect. He has struck at a rate of just over 200 in the death overs for Kolkata in the IPL. With four successive 40-plus scores in the season, Russell has combined his hitting prowess with consistency and it is a deadly combination to have as he proved on Friday.